JOHN WYCLIFFE trained “poor preachers” who lived a simple life and traveled around the countryside teaching the Word of God to the common folk of England in their own tongue. John Wycliffe was responsible for the very first translation of the entire Bible into the English language. John Wycliffe is called “the father of English prose” because the clarity and the popularity of his writings and his sermons in the Middle English dialect did much to shape our language today. One of Shakespeare’s greatest comic characters, Sir John Falstaff, was based on an English knight who was a follower of Wycliffe and who died a martyr’s death. One Pope issued five bulls against John Wycliffe for heresy, the Catholic Church in England tried him three times, and two Popes summoned him to Rome, but Wycliffe was never imprisoned nor ever went to Rome. 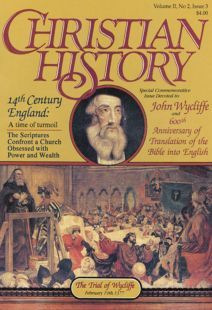 Although his English followers, called Lollards or Wycliffites, were persecuted and practically disappeared from England, John Wycliffe’s influence on the Bohemians influenced the great Protestant Reformation of the early 16th Century. In the 14th Century world, Oxford was Europe’s most outstanding university and John Wycliffe was its leading theologian and philosopher. John Wycliffe’s patron and protector, John of Gaunt, Duke of Lancaster, was also the patron of Geoffrey Chaucer and both the preacher and the poet worked in the duke’s services at one time in their lives. The Wycliffe translation of the Bible was made from a Latin language, hand-written manuscript of a translation a thousand years old and before any verse numbers had been assigned. With all of his questioning of the doctrines of the church and his criticism of the corruption of the clergy, John Wycliffe was never excommunicated nor did he ever leave the church, but, in fact, he suffered his fatal stroke while at Mass. Even though John Wycliffe died peacefully at home in bed on New Year’s Eve, the Church exhumed his body 44 years later, burned his bones, and scattered the ashes in a nearby river. At the Diet of Worms in 1521, Martin Luther was accused of renewing the errors of Wycliffe and Hus by making the Scriptures his final authority.